A pleasant surprise for a journalist during the Wednesday morning presentation was photographer Alfred Eisenstaedt of Life Magazine, who commandeered ladders, tree branches and people (notable or students) and arranged them for his pictures. Named Photographer of the Year in 1950, Eisenstaedt noted his 25th anniversary as a photographer in 1954, and is known for his superb portraits and for his sensitive news pictures. The voice of authority was speaking when he ordered Paul Engle and Donald Justice to move their class to another spot on the riverbank for a shot. The May 16 issue has a much longer piece by Dianne Grossett and Jerry Parker. Eisenstaedt, 63, left the SUI campus Saturday after a two-week stay on assignment with Life reporter Elizabeth Baker. The team was here “to re-create in pictures the life of graduate students in the creative arts at SUI,” Miss Baker explained. Their interest is in more than the conventional classroom situation, she added — in how students relax, where they live, their work, pasttimes, parties. They have visited several students’ homes, browsed about the Art, Theatre and Music Buildings, and have even been to Kenney’s. Eisenstaedt pointed out that they do not know the publication date of the story — or even that it will be published. SUI was chosen for the possible feature, Miss Baker said, “because of its varied and active creative arts program which has national reputation.” She mentioned outstanding persons such as Mauricio Lasansky and Paul Engle. The full text of both articles can be read in the links above and has been excepted here. Kenney’s was a bar on the west side of Clinton St. which was popular with the Writer’s Workshop participants. The Iowa City Public Library Digital History Project has a picture of Kenney’s which is posted in the Iowa City Past Tumblr. As far as I know, the article was never published. I also have not seen any other pictures from Eisenstaedt’s time on campus. 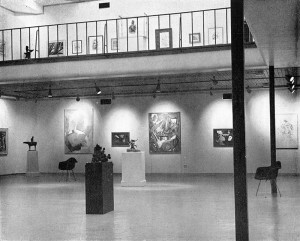 During the time Eisenstaedt was on campus, the Gibson A Danes, Dean of the School of Art and Architecture, Yale University, spoke at the opening of the annual Festival of the Arts and the dedication of the expanded art gallery (May 9, 1961) . The text of his speech as well as pictures from the festival are also available in our collection.